Raoul S. Concepcion, MD, FACS, is the current Director of The Comprehensive Prostate Center in Nashville, TN, and also has an appointment as Clinical Associate Professor of Urology, Vanderbilt University School of Medicine. He served as a resident in General Surgery and Urology at Vanderbilt from 1984 – 1990. Dr. Concepcion’s clinical interests revolve around advanced prostate and bladder cancer management. He is a past president of LUGPA and, along with two other urologists, founded CUSP, a urologic research consortium in the United States. Additionally, he serves as the Chief Urologic Clinical Officer for Integra Connect (West Palm Beach, FL), is an advisor or speaker for many companies, including Dendreon, Pfizer, Astellas, Amgen, Cellay, and Janssen, and is the current editor for Urologists in Cancer Care. 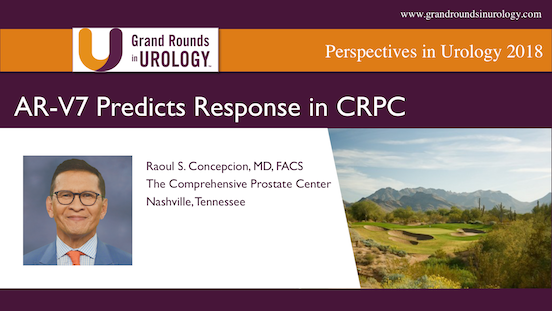 Raoul S. Concepcion, MD, FACS, emphasizes the need for more effective biomarkers when determining adequate treatment for patients with castrate-resistant prostate cancer (CRPC). Concurrently, he compares the findings of studies exploring various options, including the AR-V7 splice variant. Raoul S. Concepcion, MD, FACS, provides a brief overview of the background, incidence, and epidemiology of upper tract urothelial carcinoma (UTUC). He then discusses indications for nephroureterectomy with a cuff of bladder and possible methods for management that would be less invasive for low-grade UTUC patients. 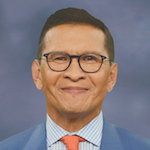 Raoul S. Concepcion, MD, FACS, discusses the challenge of managing upper tract urothelial cancer (UTUC) while avoiding overtreatment. Although nephroureterectomy is an appropriate treatment for high grade tumors, urologists should utilize localized therapy and avoid surgery in low-grade UTUC. Raoul S. Concepcion, MD, summarizes the mechanism of action behind the immune response to cancer. He also provides an update on the current and emerging immunotherapies for cancer treatment, including vaccines, checkpoint inhibitors, CAR T-cell therapies, viral vectors, and adoptive cell therapy. Ask the Expert: What Combinations of Immunotherapy for Prostate Cancer Are Most Promising? Raoul S. Concepcion, MD, FACS, Urology Associates P.C., Nashville, Tennessee, discusses what combinations of immunotherapy for prostate cancer treatment are most promising.